(we toss out about 7 million heaters yearly in the U.S.). Water heater manufactures explain in their maintenance manuals that periodic replacement of the anode rod and draining sediment from the water heater are the two most important factors in extending tank life. The TANK SAVER KIT TM was designed to address these concerns and others. To protect your water heater’s inner steel wall from corroding an anode rod made of magnesium or aluminum is installed in all tank type water heaters. This anode rod sets up a chemical reaction between the two dissimilar metals allowing the anode rod to corrode instead of the inner steel wall. Once this anode is depleted, the tank faces certain death. Installing a TANK SAVER KIT TM now and replacing anodes on a regular maintenance schedule can make the water heater you own now the last one you’ll ever need. Sediment in the bottom of your tank keeps the anode from protecting it. The TANK SAVER KIT TM includes a special cold water inlet tube that is longer than standard and designed with a curve on the end. This longer and curved dip tube moves cold water closer to the bottom of the tank pushing up more useable hot water and creates a swirling current that keeps sediment moving reducing build-up. 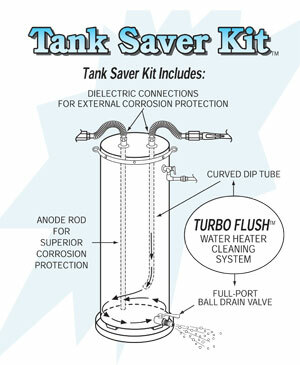 To enhance sediment removal the TANK SAVER KIT TM provides you with an all brass 3/4″ full port drain valve assembly that provides 8x more volume than the standard 1/4″ drain provided by most manufacturers. The curved dip tube and larger valve opening are the integral parts of our TURBO FLUSH TM system.